Dicey Dungeons, the upcoming card-battling dungeon crawler from Terry Cavanagh, is getting closer to release. It’s going to be shown off at PAX South, and the developer has put together a new trailer for that occasion. It features new art by Marlowe Dobbe, and tunes by Chipzel. If you’ve already played the early alphas (which you should), it’s a nice insight into where the game is going. If this is your first time hearing about it, make sure to check out the early alphas. Seriously. You can try them for free on Terry’s website. I’ve played a couple of the earliest ones, and found them hard to quit. Terry Cavanagh has made a lot of brilliant stuff in his career, but every time he decides to charge for a game, it ends up being somethings special – case in point, VVVVVV and Super Hexagon. If you’re not familiar with Dicey Dungeons, here’s a brief explanation: you pick a character class and enter a dungeon. You roam around a grid collecting cards/abilities and other treasures. When you step on an occupied space on the grid, a battle begins. The battles are turn based, and each participant rolls dice at the beginning of their turn. You then use your dice to activate those card-based abilities and do damage to your enemy, defend, heal or something else entirely. 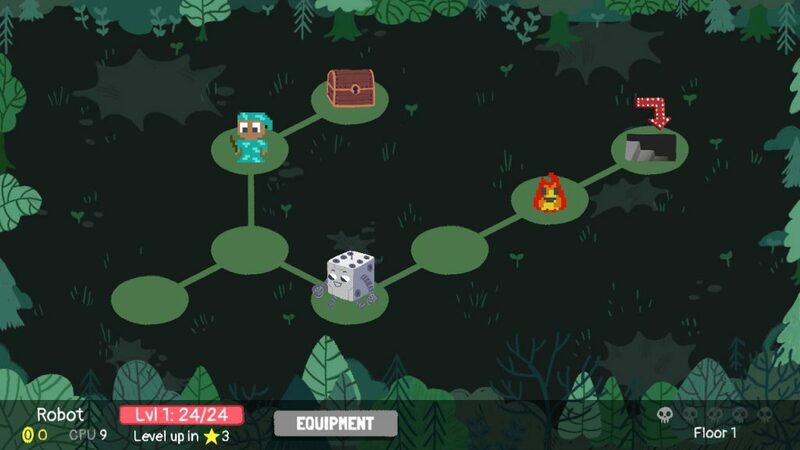 Later on you start getting abilities that let you manipulate the dice, for example, by splitting their values. But you have a limited inventory, and those cards all take up space. So you have to decide which ones to take with you, and which ones to put away. When you level up, by defeating enough enemies, you get to upgrade one of your abilities. It may sound complicated, but it’s all pretty intuitive and you should get a hang of it in no time.